Students studying at the MAPEX Training institute will be able to do further studies at Tertiary institutions in the country. The CEO for MAPEX Training Institute Mr Marcus Kara revealed this during the institute’s eighth graduation ceremony last week Friday. 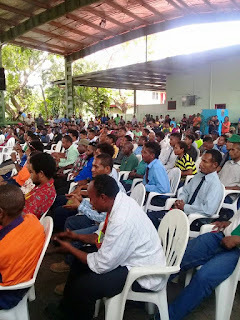 Mr Kara is still in dialogue with the PNG University of Technology and others, however the University of Papua New Guinea is one of the institutions confirmed to accept graduands from MAPEX to undergo Diploma or Degree programmes. The institution has also established recruitment pathways with Exxon Mobil, Department of Works and Motor Vehicle Insurance Limited, which has provided jobs for many graduands. ‘’We are trying our best to produce some of the skills that are demanding in the mining industry and it’s a joy seeing our students getting employed right after school,” said Mr Kara. Thirty students from the institution are currently undergoing training at the EXXON Mobil Lealea plant site. Mr Kara believes that this partnership and the vision MAPEX has can go a long way in aspiring many Papua New Guineans to persevere in life. Meanwhile, three female graduated among the 250 students with Certificates in Plant and Motor Vehicle.